The Jamis Hudson series is the perfect choice for cyclists who value comfort over speed. The Hudson is a recreational bicycle; it is purpose built for having fun, relaxing, and enjoying the benefits of cycling in a low impact way. The Hudson is offered in a few different configurations, thus adding to its popularity. First off, there's standard frames and step-thru frames. If you normally have trouble lifting your leg up to get on a bicycle, chances are you won't have any trouble getting onto a step-thru Hudson. See the pics below of the step-thru frames. The step-thru models are very easy to get on or off, quickly and easily. It is also important to note that step-thru frames are not "girl's" bikes. The step-thru frame benefits men and women alike. The next feature on the Hudson's really sets the Hudson apart from other cruiser-style bicycles; the pedal-forward design. The pedal-forward design on the Hudson is one of the main reasons this bike has been so popular. The pedal-forward design on the Hudson places the bottom bracket further ahead of the rider than a traditional frame. The bottom bracket is the axle around which the pedals rotate. By placing the bottom bracket a bit further in front of the rider, the saddle height can be set lower relative to the ground. Full leg extension is still achieved while pedaling, but the saddle is lower to the ground, so the rider can place their feet on the ground while remaining seated on the saddle. Many recreational riders value this feature. Hudson riders feel more secure on the Hudson because they can put their feet on the ground quickly without tipping over. But, its not hard to make the bike go since the rider is still getting full leg extension. This is a fabulous feature on a recreational bike. It is really nice to be able to stop, put your feet down, sit comfortably on your bike and take in the scenery once in a while. Especially on the memory foam saddle the Hudson comes equipped with, it is very comfortable! Another comfortable feature on the Hudson is the upright riding position. The Hudson has a very upright riding position, which reduces the pressure on your hands, and gives the rider a more commanding view of their surroundings. The riser handlebar and the quill stem make it very easy to adjust the height of the handlebars to suit every rider. The Hudson's are lightweight, easily maneuverable cruiser bikes. Hudson's typically weigh in at under 30lb. 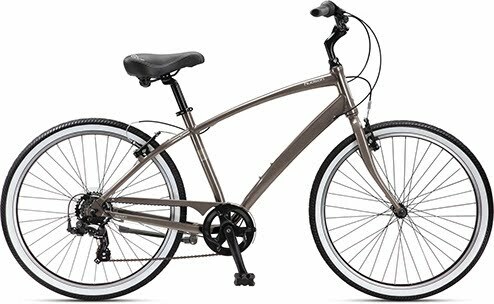 (depending on size and gearing configuration) For a cruiser bike, the Hudson has a pretty short wheelbase, making them more maneuverable than other cruiser bike designs. The Hudson comes in a few different gearing combinations. The Hudson Easy has just one speed with a coaster brake, making it the simplest Hudson available, but not the best choice for riding in hilly areas. The Hudson Easy 3 has an internally geared hub with three speeds and a coaster brake. 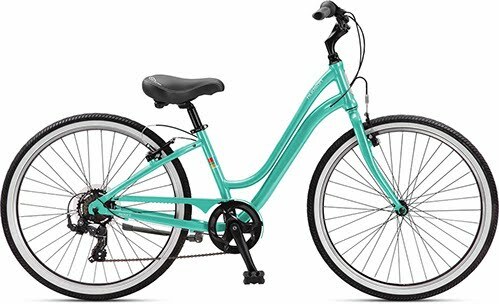 The Hudson Easy 3 is a great choice if you desire a simple bike with some range for traversing gently rolling terrain or moderately hilly areas. It has an easy gear, a flat land gear, and a go-fast gear. The Hudson Sport has a traditional, external drivetrain with a rear derailleur and a single chain ring with 7 gears in the rear. This is the best option for traversing more hilly terrain and longer distances. Until just this year, the Hudson Sport Deluxe was our favorite Hudson model. The Hudson Sport Deluxe had an internally geared 7 speed rear hub, which is a dream to shift, and basically needs very little maintenance. 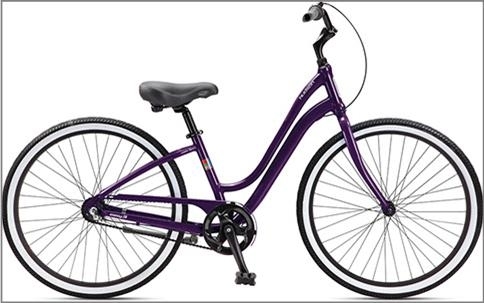 Fortunately, although Jamis discontinued the Sport Deluxe model for 2016, we still have a great many Hudson Sport Deluxe's here at Eddie's Bicycles and hockey Equipment. Stop in today and test ride a Hudson! Check out the Hudson's in greater detail on the Jamis website. Recreational Bicycles There will find other recreational models from Jamis as well, like the Citizen, a 700c comfort hybrid, and the Explorer, a 26" wheel comfort mountain bike.